St. Nicholas School was decorated with balloons and promotional banners for the major sponsor Our Telekom, the Solomon Islands Football Federation (SIFF) and event partner DJ Graphics Ltd. The closing ceremony program featured speeches and the presentation of awards and certificates to the participating schools as well as entertainment from several performers. To kick off the evening Solo Icon 2009 Junior Executive winner Junior Paul was invited to perform for the students. Barely 10 years of age Paul sent the crowd into cheers with his rendition of a popular gospel song. The first speech of the night was from SIFF President and MBE award winner Martin Alufurai who expressed to the students the importance of setting goals and working hard to achieve them. Alufurai used the example of renowned footballer, Pele to illustrate his case to the students who listened intently. Alufurai also spoke about the value of the kids festival as a development program aimed at bringing football education to the grassroots level. Benedict Esibaea, the Director of the Ministry of Education’s primary division, used his speech to thank SIFF for organising the kids festival and giving the opportunity for the participating children to visit Honiara. Esibaea said to the students that they are the few fortunate ones that have been given this opportunity this year out of the thousands of primary school students in the country. After the speeches the program went straight to the presentation of awards and prizes. The cultural night award went to Vanua Primary School and Lilura Primary School who tallied equal points. Both schools will receive $2000-00 worth of stationeries sponsored by Our Telekom. The player of the tournament award was given to Don Waoha of Parego Primary School who proved that size does not matter in football with an excellent performance for his team on the flanks throughout the competition. The golden boot award was shared between Rosco Gray of Kilusakwalo and Bernard Tamasia of Parego who both scored 4 goals. Each received a trophy. Gwaigeo collected the bronze medals while the silver medals went to Parego. 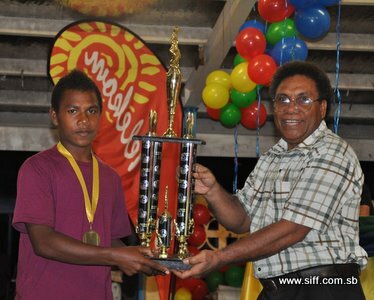 The 2010 Our Telekom National Kids Football, Cultural Exchange and Education Festival trophy and gold medals went to Kilusakwalo. Guests for the closing ceremony included the Third Secretary of the Australian High Commission William Ewing, FIFA Oceania Football Confederation Development Officer Glenn Turner, Director of Primary Education Benedict Esibaea, SIFF President Martin Alufurai and SIFF Football Ambassador Gideon Omokirio. The closing ceremony also featured the Waririi panpipers and a performance from the kids festival volunteers.